For more than 45 years, we at B.T.J.’s Jungle of West Islip, New York – your one-stop pet shop – have been loving your pets like they’re our own! B.T.J.’s is a family-owned and -operated pet store for more than four decades, and we at B.T.J.’s are proud to sell only the best quality pet care products, pet food and pet supplies available on the market today. We’re committed to the absolute health and happiness of the animals we sell – from puppies and kittens to exotic birds, reptiles, fish such as koi fish, and small animals such as gerbils, hamsters, ferrets, degus and chinchillas. All of our pet experts at B.T.J.’s are available to answer any questions you may have to ensure them a long and healthy life after bringing your new pet home to your family. 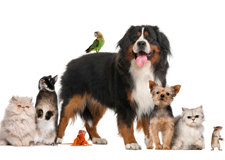 Our friendly, knowledgeable and experienced staff can also help you select the perfect pet to add to your family, as well as all of the supplies you’ll ever need, at prices you can afford. Stop in today at our pet store located at 144 Sunrise Highway and see why Long Island pet owners trust B.T.J.’s! Feel free to also call us any time at 631-587-8191 or even fill out our easy online contact form. We look forward to hearing from you soon, and thank you for visiting our website!